“This band is no good, somebody should sack them,” quipped Dave Mason when they had to stop and restart ‘Cattle and Cane’ – a forgivable blip, as the song has notoriously difficult time signatures. 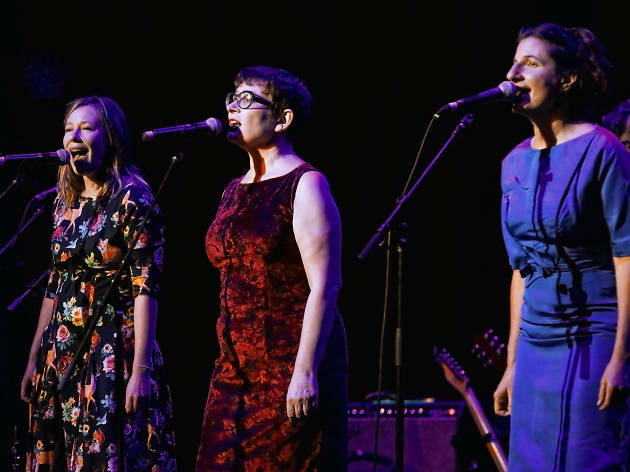 Mason, invited to the stage for the encore, was mischievously alluding to the fact that Lindy Morrison (drums), Amanda Brown (violin, oboe, guitar) and John Willsteed (guitar and bass) were not invited to join the reboot of the Go-Betweens when singer-songwriters Grant McLennan and Robert Forster reconvened in 2000, 11 years after the band split in the wake their sixth and best album, 16 Lovers Lane (1988). It must be galling to be written out of the story of one of Australia’s finest bands just because you don’t happen to be a singer-songwriter. And there is little disputing that the seventh and eighth Go-Betweens albums would have been better, richer, and more satisfying had the whole ensemble taken part. It’s a massive, massive shame that Forster and McLennan did not do everything in their power to recreate the magic of 16 Lovers Lane – one of the all-time great guitar pop albums. This celebratory concert of the entire album was an evening of jangle pop heaven, proving that the contribution of the erstwhile band members was crucial to the record’s charm – the melancholy countermelodies of Brown on violin and oboe; the gentle simplicity of Morrison’s drumming; Willsteed’s memorable bass flourishes. Their performance, aided by three Dans – Dan Kelly, Danny Widdicombe and Luke Daniel Peacock – was hampered only by a couple of poor matches of guest vocalist. Shogun from Royal Headache gave a self-conscious and stilted performance of album opener ‘Love Goes On’. The Preatures’ Izzy Manfredi struggled in the lower register of ‘Was There Anything I Could Do?’, rendering an album highlight into filler. The Blackeyed Susans’ Rob Snarski took over for the second song in, McLennan’s ballad ‘Quiet Heart’, and brought to it all the stillness and emotion that make it the album’s standout track. Romy Vager’s strident awkwardness made her a good fit for ‘Love Is a Sign’, while Kirin J Callinan livened things up in strutting cowboy mode to do Forster’s sardonic ‘You Can’t Say No Forever’. Amanda Brown put down her fiddle to sing plaintive side one closer ‘The Devil’s Eye’, prefacing her beautiful rendition with the note that the late McLennan wrote that song and ‘Quiet Heart’ while she was away from him, holidaying in New York. She did not say, and did not need to, that he wrote them about her. Prior to taking on the anthemic ‘Streets of Your Town’, The Church’s Steve Kilbey told a hilarious story about a supergroup he and McLennan once plotted to form along with Paul Kelly and Neil Finn. Trish and Jody from the Clouds delivered technically perfect harmonising on the song coincidentally called ‘Clouds’. Dan Kelly ably took on vocal duties for ‘I’m All Right’ and the album closer ‘Dive for Your Memory’ was sung by the Apartments’ Peter Milton Walsh, looking like a Reservoir Dog and spouting anecdotes about his two weeks as a Go-Between, back in the day. Was it the Go-Betweens we’d just witnessed? Absolutely. Bands are not just their lead singers. It’s about the sounds, the shared history, the feelings, the intent. Love goes on, anyway.